Ewan calls and says he'll get some forgotten statistics to Beverly at the conference tonight. Jim is upset. Sharon is doing her homework when Madge gets home. Madge is surprised that Eddie has spent the day by the pool - she'd have thought he'd want to go sightseeing as much as he could. When Eddie comes in, Madge suggests taking him to the zoo tomorrow, but he says tomorrow isn't convenient. Madge is rather surprised at this, but Eddie goes off for a bath before she can question him further. Jim is brooding about Beverly and Ewan. Helen says that they don't know all the facts - even if Ewan is there, it may only be a business trip. Helen asks if Jim could have misunderstood Ewan, but he doesn't think so. He goes to phone Beverly, but Helen stops him. She suggests a loving phone call instead of an angry one. Eddit is on the phone to someone in London saying that they'll get their loan back soon. He also tells them he's not on holiday, he's got big plans for his time in Australia. Sharon comes out and hears the end of this conversation, about Eddie owing money. Jim is distracted, much to Matt's annoyance. Matt guesses that something has happened with Beverly, but Jim doesn't want to talk about it. He tells Matt to take the rest of the day off - he's closing the workshop, this is an emergency. Matt mutters to himself that he might as well forget the whole damn apprenticeship. Jim has booked a ticket to Cairns to find out why Beverly lied to him face-to-face. Helen thinks it's a very bad idea, but Jim insists he's going to talk to her, not take to her with an axe(!) Helen insists that Jim can't afford the trip, but he says he doesn't have any other choice. Eddie is relaxing by the pool again. Madge asks if Eddie would like to go for a drive in the country with Harold on the weekend. Eddie puts her off saying he's perfectly happy sitting by the pool. He goes off to use the phone again. Caroline has come round for the Home James figures. Matt storms in, upset about the situation at work. 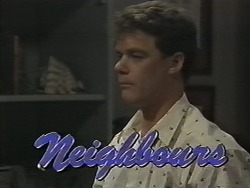 He's upset that Jim is messing him around, but Helen tells Matt that Jim has personal problems at the moment. She asks Matt to be patient and understanding for a little while longer. Paul and Christina have had their dinner and watched a terrible movie(!) He suggests going on to a bar and she agrees. Sharon and Eddie are watching TV. The phone rings and Madge answers it - it's one of Eddie's "friends". 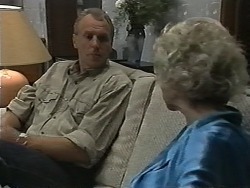 When Eddie has gone off to his room, Sharon mentions to Madge that she's overheard Eddie talking on the phone - it sounded like Eddie owed some money to someone. She thinks Eddie might be hiding something, and Madge agrees that things seem a bit fishy. Paul is telling Christina tales of his youth and then suddenly asks her why she hasn't got a steady boyfriend. She tells him that she doesn't really like talking about it - she was seeing someone before she came to Erinsborough. Paul suggests they just concentrate on having a good time now - and orders some cocktails! Eddie is telling Madge about his history in London - how he started out in the markets selling joss sticks, then went on to a Chinese takeaway. He goes out for a swim again. Madge and Sharon wonder what to do about the phonecalls. Just then, the phone rings and it's another call for Eddie. After speaking to the person, Madge thinks it might be a business call, not a personal call. She resolves to find out exactly what's going on. Beverly arrives home - her lecture was placed first so she got to come home early. 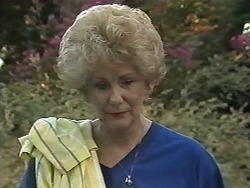 Helen is surprised to see her and is forced to admit that Jim has gone to Cairns. Beverly drags it out of her that Jim found out that Ewan was there. Beverly is angry - Ewan was never in Cairns, nor had any intention of going! HELEN: Ewan phoned after you left. He seems concerned that you'd forgotten some papers. BEVERLY: Yes, some preliminary statistics we'd compiled - so? 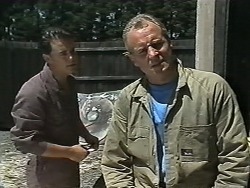 HELEN: When Jim told him that you'd already gone, he said not to worry, he'd get the papers to you in Cairns himself. BEVERLY:(angrily) He did - BY FAX!!! HELEN: Oh. Jim obviously misunderstood. BEVERLY: No, he didn't. He just plain didn't trust me. Paul and Christina get home late. Paul is rather drunk and suggests a night-cap. Christina goes off to freshen up while Paul makes coffee. He makes so much noise that he wakes Caroline up and she stumbles into the living room in her dressing-gown. Paul puts his arms around her. PAUL: Don't you think we should end the perfect evening in the perfect way? He kisses her and Caroline fights him off. CAROLINE: Stop it! You're making an awful mistake. PAUL: It wouldn't be a mistake between you and me, Christina. He kisses her again and Christina comes into the living room. CHRISTINA: Would you two like to tell me what you're doing?